Toy Rotation is exactly like it sounds, you cycle in and cycle out toys. 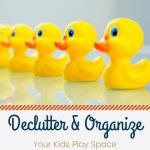 By sorting through the toys you declutter, organize, and keep the kids more engaged with the toys they already have! It makes sense right? Have you ever brought out an old toy that seems new again? The kids are taken with it. It suddenly becomes their favorite toy. Young children learn from their play. They need a variety of activities – indoor, outdoor, active and quiet play. It is important that kids have choices. 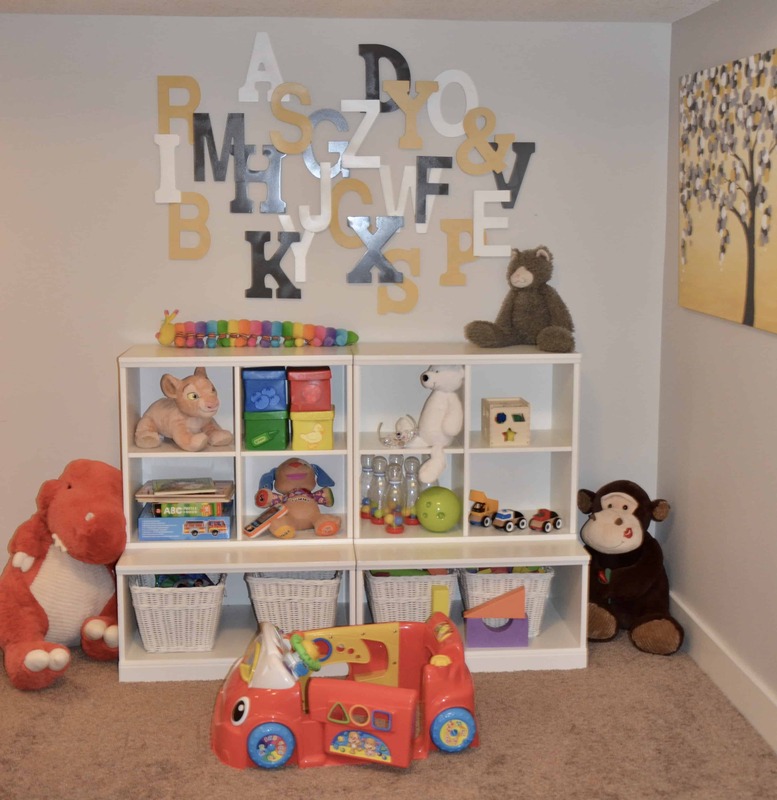 By establishing a toy rotation, you keep things fresh for your kids. It sparks imagination, creativity, and breaks the pattern from the same old same old. In order to do a toy rotation, you’ll have to spend some time up front sorting through and organizing toys. We have most of our toys in the basement and a small amount in other areas of the house. My primary concern is the basement, so that’s where I focused my attention. First, consider the primary purpose of each toy. Is it something to build with like blocks or Legos? Does it encourage logic like puzzles or brain teasers? Does it involve imagination like dress-up, doctor instruments etc? Other categories could include music, science, math, and literacy skills development. You get the picture. Now that you have a sense of the types of toys you have, sort toys into 4 buckets. You’ll want to make sure you have a variety of the types of toys in each bucket. At the end of the process, you’ll have a minimum of one bucket for each week. If you have a lot of toys, you may have more than one bucket for each week. My husband and I started sorting the things that were the most obvious, for us that was puzzles. Immediately, we put a few puzzles in each box. Then we moved on to building toys (blocks etc.). 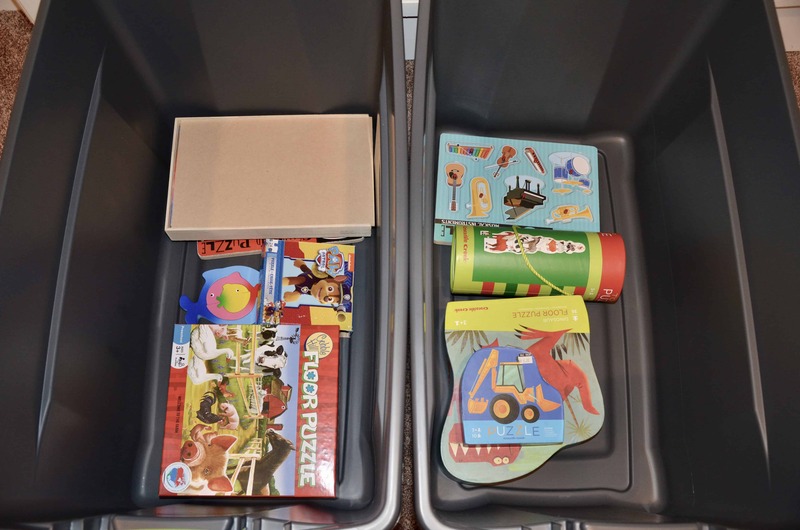 Each time we grouped the toys, we immediately put them into the 4 boxes and then moved on to the next category. The process took about an hour. After we sorted everything into the four boxes, we picked one box to unpack and put out for the kids for our first rotation. The other boxes were stored for future toy rotations. We had several large items that were too big for the boxes. One large toy was selected to stay out and the others were put up in storage. In the winter, we rotate every 2-3 weeks and it worked fine. For weeks where we have a lot of indoor time, we could have rotated the toys more frequently to keep the kids even more engaged. So, what happened when we removed 75% of our kid’s toys? When we originally did the toy rotation, I was really concerned about my 4 year old’s response. I thought she might freak out when she saw the new space. I fully anticipated that we might have one of those Jimmy Kimmel moments when the kid thinks that their parent ate all of their Halloween candy. If you haven’t seen it, you can check it out here. Here’s the good news, we are 4 months into the toy rotation and she’s never even noticed that we removed 75% of her toys!!! I was stunned! We have loved the tidy space. 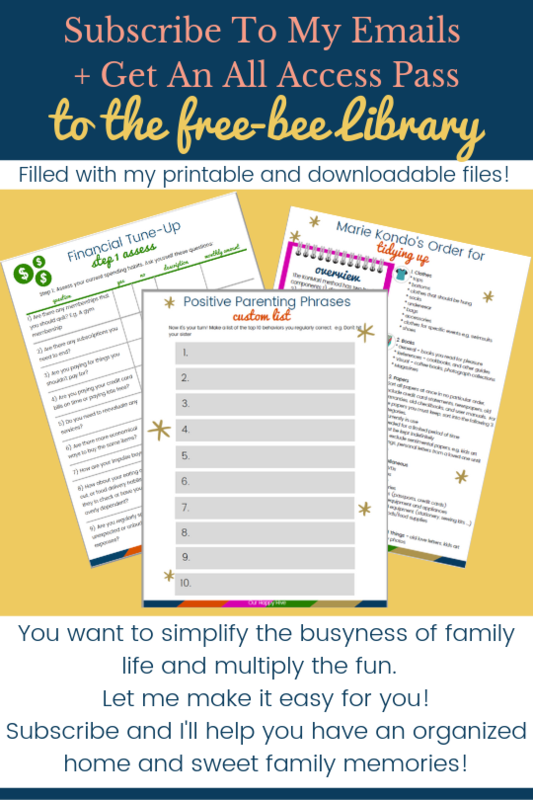 It’s so much easier to keep things organized and the kids are re-engaged when the new toys come out. Note: We do the rotation when they are asleep, otherwise we may have mayhem if they actually see us removing toys. The only challenge we have had is on the occasion when there’s a request to play with a specific toy like a board game and we need to go searching through the storage bins. Thankfully this has only happened once or twice and in reality, it only took about 10 minutes to locate the desired item! 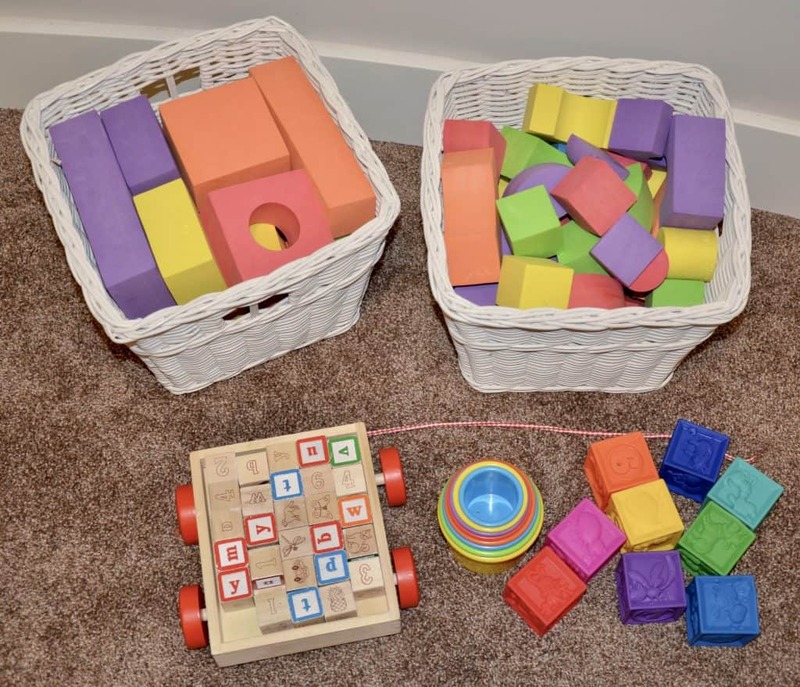 Toy Rotation is a really simple and practical solution. It’s easy to implement, helps keep the play space in order, and keeps things fresh for the kids! 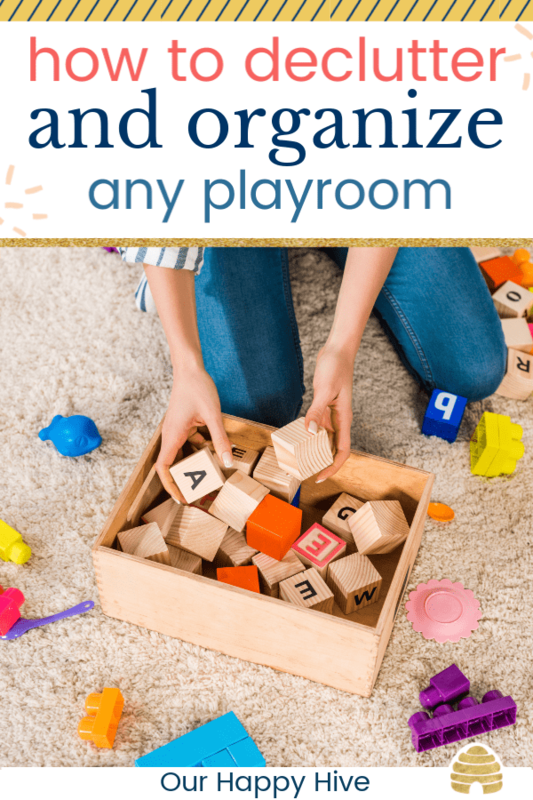 Really, it’s a win-win solution for parents that are overwhelmed with too many clunky toys, small toy pieces strewn across the floor, and bored kids. What are you waiting for! Start a toy rotation this week! You won’t regret it! I’m also a SAHM of 2 under 4 and I swear I’ll buy any toy that might keep them occupied for a few hours. Having a variety of toys in each bin is key. When I first started rotating, I organized the tubs by type of toy and the kids would get so bored. We just did KonMari on our playroom and I couldn’t believe how much “junk” we had in there. Now the kids have a lot of room to play and they play longer with just a few toys. Organization soothes me! 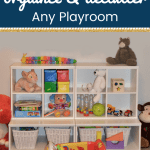 This is a great way to organize toys so they are out of the way but still accessible. I rotate toys every so often too, but I’m not nearly as organized about it as you are lol. I need to invest in some of those heavy duty plastic boxes. Toy rotation is brilliant! I love organizing ours in pretty bins and shelves, but it still feels like too much. I love the idea of sticking some of it out of sight! I wish I would’ve thought of this when my twins were babies! 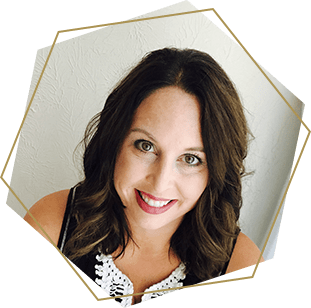 We just dove into their playroom and hoped for the best! 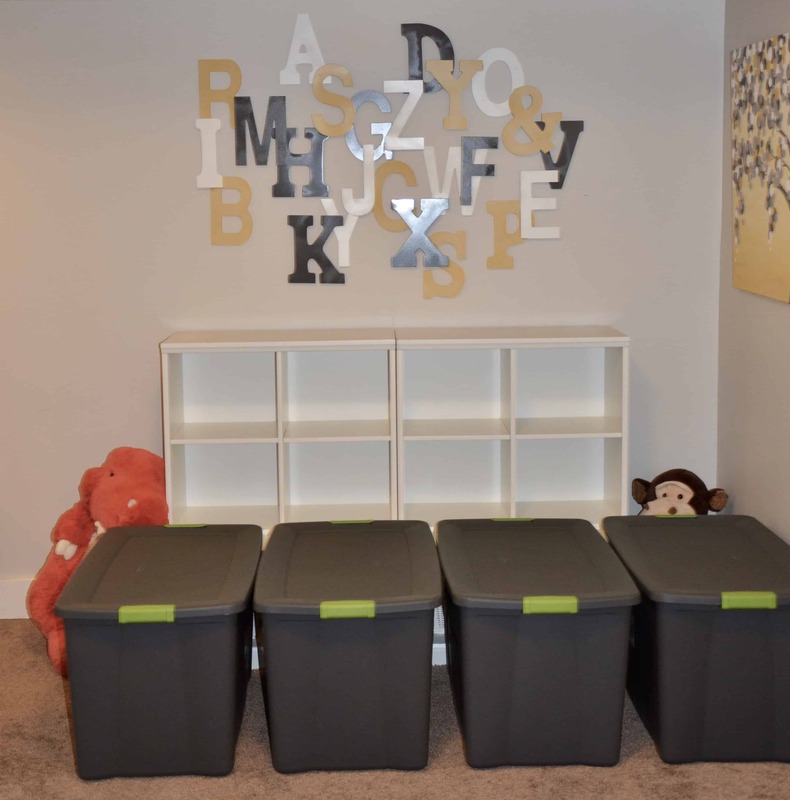 This is such a great way to keep the toys organized and fresh for the kids. Saving this for when hubby and I start our family :-). Great idea! We’ve put old toys away for little brother but I never thought about rotating the toys we have. Definitely something I’ll work on organizing after the Christmas loot 😳. Update…Little Miss E and Baby G didn’t even realize anything was missing. They went downstairs with the nanny before I could “prep” them. Report is that there were no questions about it, no reaction what so ever!!! Why didn’t we do this sooner?!? Lovelovelove the idea of a toy rotation! Sounds like it would be beneficial! !